I don’t feel like myself this week. I feel more like a midwestern mom with four children and a pastor husband. Not my quirky rebellious northwestern self with an only child and a tech for a spouse. I’m not entirely crazy. Really. Ok maybe I am. Though I bet it has to do with the food and less with my losing my mind. This week I’m living life through someone else’s victuals. Things I’ve never made and never really thought of. Meals with a very mid-west twang. Can I say twang for midwestern food? Probably not. My assignment is to shoot a five day menu of a woman who lives and cooks many states away. It feels like acting. I can almost envision myself becoming a better person. Well, let’s not go that far, but I am having fun and this is a good reminder of how vast our country’s food roots are. Sometimes I forget when I don’t travel out of my northwest corner enough. I haven’t spent much time in the midwest exploring their food culture, but it’s on my bucket list. For several years I’ve dreamed of eating my way through the Minnesota State Fair. If I ever get there I’ll be sure to buy pants three sizes too big and an extra large passenger ticket for the plane ride home. These cookies are a variation on an old Weetabix Chocolate Chip Cookie recipe. I called the company, but the recipe is so ancient no one can remember the origin. 2. Cream together butter and sugars. Beat in vanilla and egg. Add dry ingredients and mix well. Stir in butterscotch chips. 3. Drop dough by tablespoonfuls onto an ungreased baking sheet and bake at 350 for 10 to 12 minutes. Cool on baking sheet for about 2 minutes, then transfer to cool completely. Recipe adapted from the Weetabix recipe collection. Picture by Laura Flowers. I love weetabix!!! I never thought about using it in cookie recipe. I'll have to try this out one day! Hmmm, I've lived all over the US, from the east coast to the midwest, and I've never heard of a weetabix. I must be missing out. Interesting recipe, and great pic! Haha I would like to eat my way through a state fair, just once. To say that I did it. These cookies sound awesome! I can't remember the last time I had weetabix! I have never heard of weetabix ceral. Great looking cookie. I've never even HEARD of Weetabix, but Laura, thanks for the laugh today! I needed it:) Happy Labor day! Your posts always make me smile. I would love to see all the photographs you are taking right now, but I'm glad you share so many other great photos/recipes on your blog. I've never heard of weetabix before, but you better believe I know and love butterscotch! What the what? I live in the midwest and have never seen nor heard of this "Wheetabix!" Never! It's not for sale in Kansas, I swear. I feel left out, though it doesn't look like something I would relish eating--lol. When you come to the midwest to explore our food culture, be sure to pop in! I, live to experience...especially the food diversity that we are fortunate to be offered in our surrounding abundance. How lucky are we? As a youngster....I had seen some Weetabix commercials...otherwise, I would have no clue at this point. We can't buy it in Quebec...well, not as far as I'm aware of. I can easily substitute it for bran cereals ;0)...and I do love butterscotch. 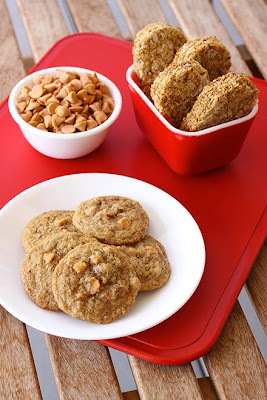 Thanks for sharing your dusted off recipe ;) The cookies look darn good! wow che delizia!! sempre bravissima!!baci! What an interesting assignment. Sounds fascinating, as do these cookies. I feel in love with weetabix with chocolate while visiting my friend in London. Delicious. They look yummy and inviting. Oh, I totally love the role-playing game; sometimes I cook other country food, and decorate the table and have even a Japanese kimono to dress up. It’s fun. Your cookies look lovely, I'm sure they are yummy too. What is weetabix? I dont remember ever hearing about it.......sounds interesting.